Let's have a chat over a nice cup of tea. Well, you can have coffee if you want. 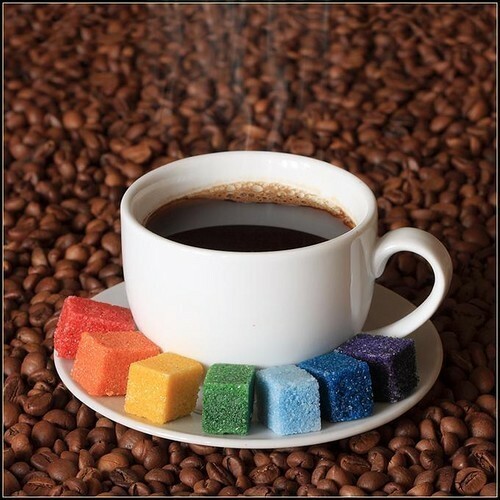 I've never liked coffee, but I'll be having some of that rainbow sugar if you don't mind. With my tea. I take milk. Sorry about my absence. I feel like we never chat anymore, you and me. We should do that now! OK, I'll start. This is my blog after all. what I was going to eat later and also thinking about the ball I was trying to keep up with my hands and how amazing my brain was for being able to think all of those things at the same time and trying to decide if my brain was simply a brilliant organ or if I was too scatterbrained and flighty to concentrate on one thing at a time. And then I dropped the ball. 2. WAIT A SECOND!!! I haven't told you anything about any rehearsals yet! Um... Can you wait, just for a few days? Before I tell you, I'd like to have something to tell you. Know what I mean? Oh, never mind. 3. This year, both Barack Obama and the Queen of England will be visiting Ireland, within fourteen hours of each other! That's nice of them. Apparently Obama's oldest living relative lives somewhere near where I live, so he might pop over. Princess Margaret, the Queen's sister, once visited the town where my mother grew up when she was a little girl, and I still have one of the dresses Lady de Vesci used to wear. It's gorgeous. Anyway, the visits will be great for the economy. That's good. 4. Bo Burnham will be coming to Kilkenny in June, as part of the Cat Laughs festival. I'm not really a big fan, but I'm glad people on YouTube and the Internet are being seen by IRL people as real entertainers, not just teenage crushes. Not that I'll be able to go, the Cat Laughs is strictly over eighteens. Still, it brings €8 million into Kilkenny! 5. I read an amazing book recently, called The Queen Must Die by K.A.S. Quinn. I think I'll write y'all a review! But not in this post. You might have noticed the new Reading List over at the left there. Thing is, I keep buying books, but I never have the time for reading them anymore. So I've decided to be very strict with myself and I am not allowed to buy anymore books (sob) until all the books in this list have been read. Every single one of them. I've just finished To Miss With Love by Katharine Birbalsingh, which is a MUST if you go to, or have ever gone to, secondary school. No matter where you live. Go read it. Oh, and thank you all for your kind, supreme patience. Wow, your unread books list tops mine by FAR :/ that's a good idea though. Quantifying it all. I'm just sort of lost in a vague cloud of unread books. Maybe your brain is extra-observant though, I'm not sure I could take in that many people at once! BO BURNHAM?! IF YOU GO YOU MUST TAKE PICTURES AND FANGIRL OVER HIM FOR ME OMQ. Oh, and yes, I'm very curious to hear your review on the book!